In an op-ed last week, former Ohio governor Bob Taft and GWI collaborator David Wilhelm (Hecate Energy) made a bi-partisan appeal. Amid an intensifying election season in the U.S. (and in Tanzania), they called on voters and politicians to remember the importance of planting seeds for the future with positive international engagement. Both Wilhelm and Taft have a history with the country of Tanzania–Taft as a Peace Corps volunteer in the 1960s, and Wilhelm as a lead on a major solar power and development project underway with the University of Dodoma. Wilhelm and Hecate Energy are partners on GWI’s WE3 Program. 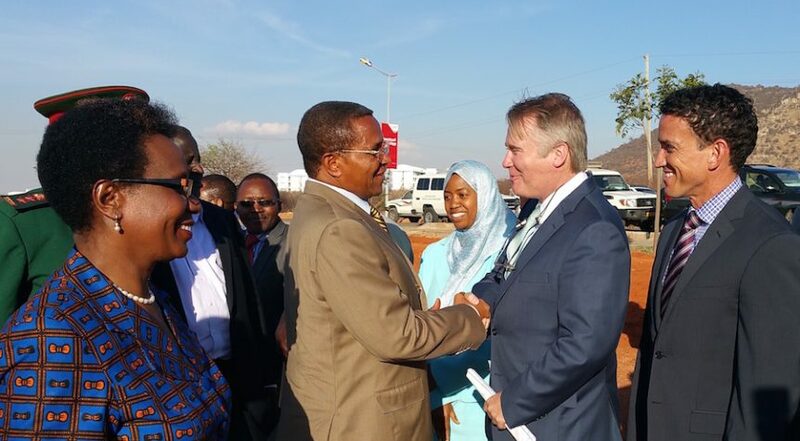 Photo: David Wilhelm, Chief Strategy Officer for Hecate Energy, shakes hands with Jakaya Kikwete, former president of the Republic of Tanzania at a 2016 ground-breaking for a 55-MW solar power plant at the University of Dodoma in Tanzania. Source: Hecate Energy.